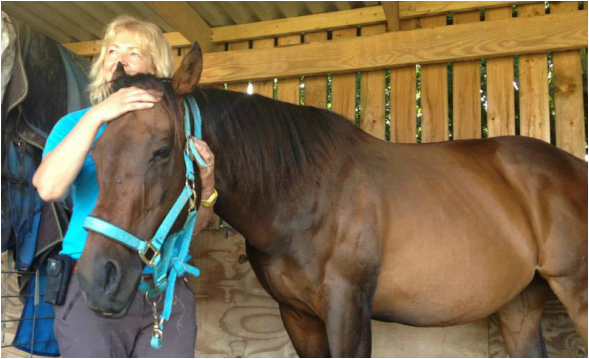 ​An Equine Sports Massage Therapist works as part of an equine professional health team. Equine massage therapy is not a replacement for veterinary care but is used alongside conventional health care. I will ask for your vet's permission before attending an appointment with your horse. An assessment of the horse moving in hand, on the lunge or under saddle where appropriate. This will include an analysis of your horse's posture, balance, asymmetry and muscle usage while in motion. Visual (taking conformation into account) and palpatory, looking for any obvious signs of soreness or tension, muscle atrophy or over development, fascial restrictions, heat/cold, swelling, . Effleurage - a rhythmic stroking which introduces the horse to massage and prepares him for deeper/more intense work. It is begun with firm but gentle strokes, with gradually increasing pressure as the muscles relax. This rhythmic stroking of tissue causes a release of natural opiates, endorphins, which helps reduction of pain or discomfort. It increases local tissue temperature and helps eliminate toxins by enhancing venous and lymphatic return. Compressions - Stimulates circulation and helps break down stiffness and tension in muscle. The techniques replicate naturally occurring pressure changes within the tissue which helps mobilise blood and fluids, enabling muscles to be more efficient. Cross fibre frictions - Friction techniques are variations of rubbing and work by compressing tissue against bone. Used for small areas or on specific areas of tightness. Friction is a firm rubbing, heat producing technique. It differs from other techniques in that it is intended to irritate an area to break down tissue and stimulate healing. Tapotement - Invigorating and stimulating. Improves local and overall circulation, warms the muscles and improves muscle tone. Passive stretching movements may also be used where appropriate. Passive movements and stretches aid the normal proprioceptive mechanisms within the body and are aimed at maintaining or restoring a normal range of movement. Equine Myofascial Release - equine myofascial release is a gentle, non-invasive, effective method of working on the connective tissue which permeates the body, affecting all areas of the horse and which provides the body's shape and form. Myofascial Release works by releasing restrictions in the fascia. Because it is a 3 dimensional web, a restriction in one area has a knock on effect and may cause asymmetry and discomfort in another. 4. Additional therapies - Where appropriate I may also include Low Level Laser Therapy, a Red Light Photonic Therapy session, a SCENAR and/or a Physiopod session. For more information on these therapies please see the relevant tabs at the top of the page. Please have your horse in and ready for me - while I do allow a generous amount of time per visit, time spent getting your horse in and cleaned up etc. is time I could be spending working on your horse. To enable your horse to get the most out of my visit please ensure where possible that the horse is dry and mud free. I some times use low level laser and a small deep oscillation unit and neither of these can be used on wet or muddy horses. It is also really difficult to massage a wet horse as my hands tend to slip over the coat rather than massage the muscles. Shelter of some description is essential in inclement weather and on hot, sunny days. Neither the horse or I enjoy getting soaked or burnt to a crisp and for the reasons mentioned above, it makes massage very difficult. Please don't apply show sheen/coat dressing or hoof oil on the day - these also interfere with massage. Fly spray is fine. There is nothing so powerful, nothing less violent. There is nothing so quick, nothing more patient."